Spain, Britain and France, alongside other EU nations, have now also recognised Venezuela’s opposition chief Juan Guaido as the country’s interim leader, after President Nicolas Maduro defiantly rejected an ultimatum by European countries to call snap elections. Russia, one of the main allies of Maduro’s regime, slammed what it dubbed European ‘interference’ in the oil-rich but impoverished Latin American country, saying it was an attempt ‘to legitimise usurped power’. After announcing the Spanish government’s official recognition of Guaido, Prime Minister Pedro Sánchez urged the 35-year-old National Assembly head to ‘call elections as soon as possible, elections that have to be free and democratic’. Sánchez added he wanted to spearhead a plan of humanitarian aid for Venezuela in the European Union and United Nations. The British Foreign Secretary Jeremy Hunt promptly followed suit. ‘UK alongside European allies now recognises @jguaido as interim constitutional president until credible elections can be held. Let’s hope this takes us closer to ending humanitarian crisis,’ he said on Twitter. 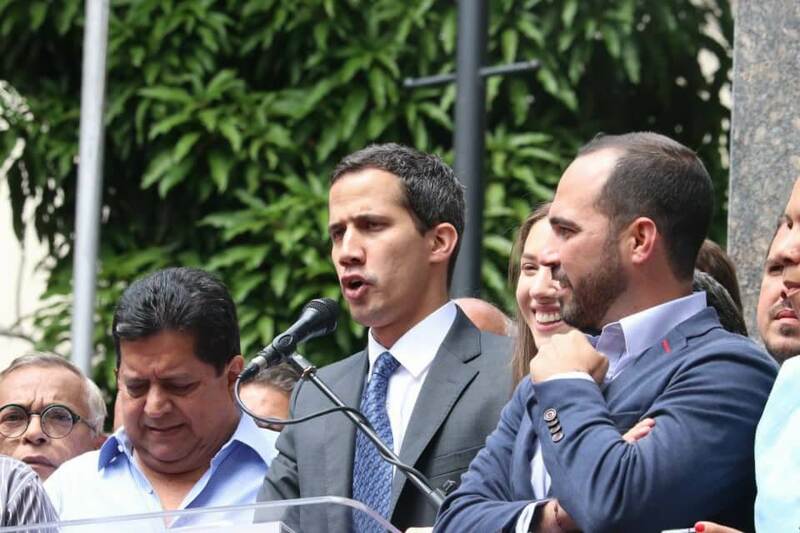 France, Austria, Sweden and Denmark also recognised Guaido. ‘Venezuelans have the right to express themselves freely and democratically,’ French President Emmanuel Macron tweeted. But in an interview with Spanish television station Sexta broadcast on Sunday evening, Maduro said he would not ‘cave in to pressure’ from those calling for his departure. However, he supported plans for a meeting of Latin American and EU states in a ‘Contact Group’ meeting in Montevideo next Thursday. And he called on Guaido for ‘face-to-face’ talks, which the latter has already rejected. The situation has long been denounced by the opposition and Guaido stunned the world on 23 January when he declared himself acting president at a rally, declaring Maduro’s presidency ‘illegitimate’ and founded on flawed elections. Canadian Prime Minister Justin Trudeau spoke Sunday with Guaido, praising his ‘courage and leadership’. Guaido is expected to announce a date for the arrival of humanitarian aid from the US – a path Maduro believes will lead to a US-led military intervention. In Washington, US President Donald Trump warned that military intervention remains ‘an option’ for dealing with the crisis in Venezuela. Tens of thousands of people turned out Saturday for competing shows of support for Guaido and for Maduro who was sworn in on 10 January to a disputed second six-year term. During the protest, Guaido announced the installation of collection centres for medicine and food – items lacking in Venezuela – in neighbouring Colombia and Brazil. Guaido has called for a new demonstration on 12 February, and another protest to push for the entry of aid.